Om nom nom. 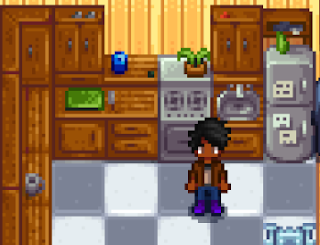 Everybody needs to eat, and Stardew Valley has no shortage of delicious recipes you can cook up. Before you can do this, though, you need to make a substantial upgrade to your house: you need a kitchen. It’s a simple enough proposal, but when you’re just getting off the ground building the kitchen may take a few seasons. After requesting the upgrade from Robin and waiting for a few days you’ll get an expanded house with a nice, spacious kitchen in the west wing. The kitchen contains a stove for cooking and a fridge which you can use to store items, just like a Chest. The stove is, of course, the more important of the two features, and it’s here where you can begin preparing meals. Question is, where do you get the recipes for those meals? Watch the Cooking Channel. Check your TV daily and there’s a chance you’ll see the Cooking Channel as an option. The Channel teaches recipes if watched. Befriend villagers. Many of the NPCs in Stardew Valley are cooks in their own right, and will send you recipes in the mail if you give them enough gifts. Purchase the recipe. Gus has a number of recipes for sale at the Stardrop Saloon. Some of these purchases may overlap with recipes you can learn from the Cooking Channel or via befriending villagers. Learn the recipe via Skill levels. This won't happen very often. It’s not that difficult to gather recipes, but it does take time. Below is a listing of the recipes in Stardew Valley, alongside methods of acquisition. You can check the necessary ingredients and effects of eating each food item by approaching your stove and hovering your cursor over the recipe. You can also check the Cooking tab under Collections in your main menu, but it will only show recipes you've already created.